Jakobi just turned five years old, so we had a chance to party! 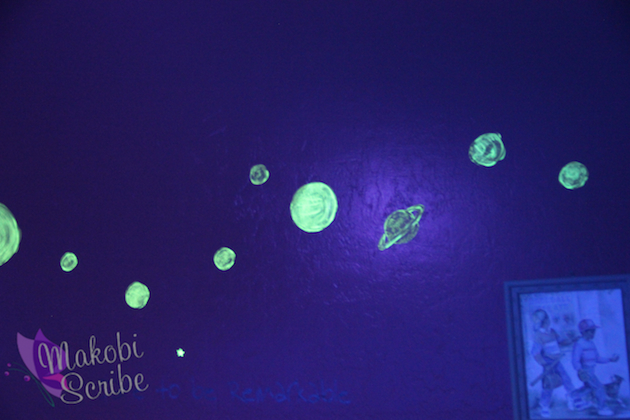 Since he was a big boy now, we worked on Getting Your Kids Back Into Their Room and then Creating A Bedroom Your Kids Will Love with our Disney Paint theme, we wanted to have a party to show off our Out Of This World room! We invited five boys (and their parents) to come over and celebrate. Guests even brought new sheets since they new he just got new bunk beds. Painting the room along with the new beds was the way I was finally able to get them to move from their older brother’s room to their own. One of the party activities we did was to find the special glowing stars we hid in Jakobi and Mason’s room. I had marked a few of the glow-in the dark stars with a yellow highlighter so that when we turned on the black light, it would glow different than the other ones. We also had a counting game, and made a song of all the planets. Then we turned off the lights and pointed them all out. Tristan found quite a few of the special stars so his mom won a $50 gift card from Walmart. Now she can buy some Ready, Set Glow! Disney paint, part of the Glidden Disney paint line to recreate the look in Tristan’s room. Since I let the boys help me paint my planets, it is not as perfect as the ideas on the official website. You can find how-to videos on using the paint on the Disney Specialty Finish at DisneyPaint.com. It is my opinion that my kids are going to be the next Picasso, but if your opinion differs from mine look at how the pros did it below. What is really cool is how impressed the moms (and one dad) were about the party. Shawna was in love with the idea, so it is pretty cool that her son won the Walmart GC. The paint was super easy to use and I can’t wait to try out the other projects that I found while browsing around the Disney Paint site. Compensation and products for review were provided by Glidden via MomTrends. The opinions expressed herein are those of the author and are not indicative of the opinions of Glidden. I’m so glad your little guy treated to this room. What a lovely treat. I had no idea that Glidden even made glow in the dark paint! That’s so cool. My daughter had those peel and stick stars on her ceiling, but this would be so much prettier! That looks awesome! My kids would LOVE that. I love your version of the solar system. Happy birthday to Jakobi! It looks like a great time was had by all. It was meant for me to see this post. My daughter wants the glow in the dark paint on her ceiling, and I don’t mind her having it -I’m just scared to paint any room in our home! In the past I’ve always had someone else to paint, but this time I have to take on the task. We’ve the paint, drop cloths, tape and everything – the only hold up is me and my insane fear! Now, I know I have to just jump in with both feet and do it. These walls look GREAT.